Since we’re huge Mayday Parade fans, just wanted to let you know…… Evidently Ray’s is closed. No matter what you’ve heard The Bravery do not have fake American accents and they’re not from the UK. What they are is a tight rock band from New York with a hint of Brit pop in their delivery. They blew us away with their performance last night at the Sound Advice Amphitheater in West Palm Beach. While it is never easy to open for a band like Incubus, The Bravery was well worth the early scramble to our seats. While songs from their latest cd The Sun and The Moon were well received, the crowd reserved their greatest enthusiasm for Unconditional and An Honest Mistake from their 2005 debut album. 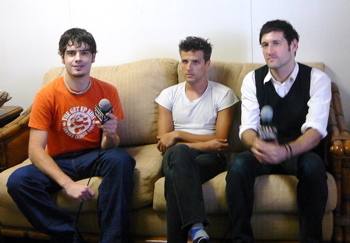 Our interview with the Bravery will be posted shortly…….